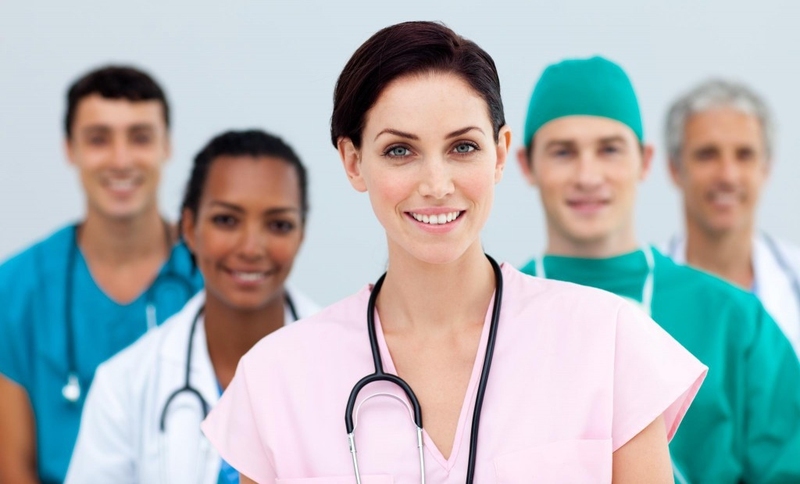 Careers in the medical field vary widely and there is a high demand for health care jobs. Depending on your choice, you may spend as few as a few months or as many as 10 years or more in college to get into a medical-related job. With good education and a desire to help others, you can to start a rewarding career in any of these jobs. Find out more about medical field careers and see which one suits your interest. Duty: Medical Doctors (M.D.) and Doctors of Osteopathic Medicine (D.O.) spend many years of study in medical school, and undergo internships and residency training. They diagnose conditions and treat patients for a wide range of medical problems. They may also specialize in different areas, including preventive medicine as well as holistic patient care. Salary and outlook: Predictions from the Bureau of Labor Statistics state that employment opportunities for doctors and surgeons will significantly increase in the years to come. The average salary of doctors varies, but general internists may make about $187,000 annually. Duties: Pharmacists should acknowledge of drugs interactions and compositions of both prescribed and OTC ones. They need also give advice for clients on laws that regulate the use of some drugs. Salary and outlook: The average salary of pharmacists is about $119,000. And the expected job openings in the following year can be more than 41,000. Duty: Nurse practitioners provide some services similar to a physician's duties such as performing physical exams, counseling patients and authorizing certain treatments in clinics and hospitals. Salary and outlook: Nurse practitioners get paid very well with an average annual salary of about $92,000. If you want to earn huge salaries in these medical field careers, try to get jobs in the urban areas of Indiana, Texas or California. Duty: Physical therapists help patients improve mobility and control pain associated with physical activities. Doctors often refer patients with various physical issues to physical therapists to begin rehabilitation designed to improve their mobility, increase their strength and relieve pain. Salary and outlook: There is a growing demand for physical therapists. Their annual wage is around $81,000. Those who work in urban home health care, schools, and nursing care facilities may earn higher salaries. Duty: Dental hygienists, as one of the best medical field careers, are responsible for cleaning and maintaining tooth and gum health. They also guide patients about oral health. They may have private offices, or work in schools, offices and other public health programs. They may also work in dental offices together with dentists. Salary and outlook: Hygienists make good salaries, considering that many work only part time. They can make around $71,000 annually or higher if they work in urban settings. Duty: A registered nurse may specialize in specific conditions or roles such as in the emergency room. They may have a wide range of duties, including monitoring of patient's physical status, dispensing of medications, performing tests, and administering procedures, usually under the supervision of a physician. Salary and outlook: The median salary for registered nurses is around $66,000, with the highest paid nurses working in California. Below is chart of more medical field careers along with their salary and prospect details. For more detailed categorization of medical field careers and how much they make, just click here. Here are some of the skills and qualities you need to engage in medical field careers. Patients often deal with physical as well as emotional difficulties, so you must be able to empathize with your patients, treat them in a kind, caring and gentle manner, and show an inspiring and reassuring behavior. You should be a good listener. Whether you are a doctor trying to obtain a medical history or a nurse observing a patient, you must be able to handle information without the need for patients to repeat themselves unnecessarily. You must be able to work harmoniously with the different personalities, including patients, physicians, and other co-workers. Just like many other field, medical work also requires team working. You must be able to adapt different roles ranging from assistant to medical and administrative duties. You must also be able to anticipate patients' needs, but without becoming emotionally attached to patients. Patients may confide personal and confidential medical information to you. You must be nonjudgmental and treat your patients fairly, regardless of their personal and health history. You must be able to think quickly to help patients with various issues regarding not only their health, but even other concerns such as insurance billing issues or schedule mix-ups. You must have excellent written and verbal communication skills to relate to patients, colleagues and other workers. And you will need to efficiently create documents needed at work. You must be able to multitask, at the same time be well organized to deal with numerous responsibilities daily, such as scheduling appointments, ordering lab tests, accomplishing patient charts, and communicating with insurance companies. Having a system of organization can help you work effectively and efficiently. Also you can take a test here to find out which one is suitable for you.